These fresh Strawberry Cupcakes have a delicious strawberry flavor and chunks of fresh strawberries in the cake batter. Then they’re frosted with strawberry frosting made from real berries for the perfect pretty-in-pink cupcake that’s made from REAL strawberries. Have you ever seen a cupcake as pretty as these strawberry cupcakes? They’re actually made with a triple dose of strawberries including strawberry purée and pieces of fresh berries in the batter, and there are fresh berries in the frosting. 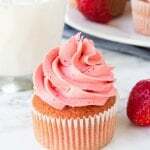 You get a delicious strawberry flavor, moist and fluffy cupcake texture, and beautiful pink colour. The cupcakes didn’t actuallly taste that much like strawberries. But I wanted a strawberry cupcake recipe that had an obvious strawberry flavor AND used real berries. 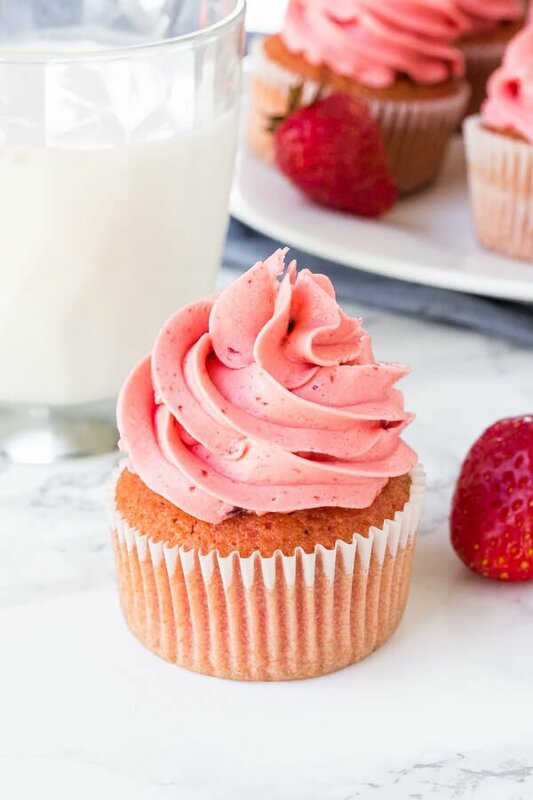 The strawberry flavor in these strawberry cupcakes comes from strawberry puree. You’ll puree fresh (or frozen) strawberries in your food processor or blender. However, puree has too much water in it, so you can’t add it directly to the cupcakes. So, we boil down the puree first to remove the excess liquid. By reducing (aka boiling down) the puree, you get a more concentrated strawberry puree that adds more flavor without the excess liquid. These strawberry cupcakes are topped with fresh strawberry frosting. 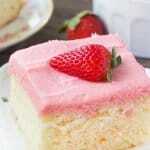 The strawberry flavor in the buttercream also comes from strawberry puree. Unlike the cupcake batter however, you’ll boil down the puree even more until it’s the consistency of jam. You want it to be extra thick so that your strawberry frosting turns out thick, creamy, and never watery. The fresher, sweeter, and more vibrant red color your berries have – the better your frosting will be. Cool the reduced puree completely before adding it into the frosting. It needs to be cold (not even the tiniest bit warm). If it’s warm, it can make the frosting separate. Use real butter – not margarine. For a more vibrant red color, you can add in a few drops of red food coloring. 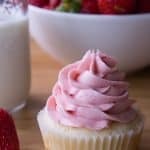 Can I make these strawberry cupcakes without the strawberry puree? 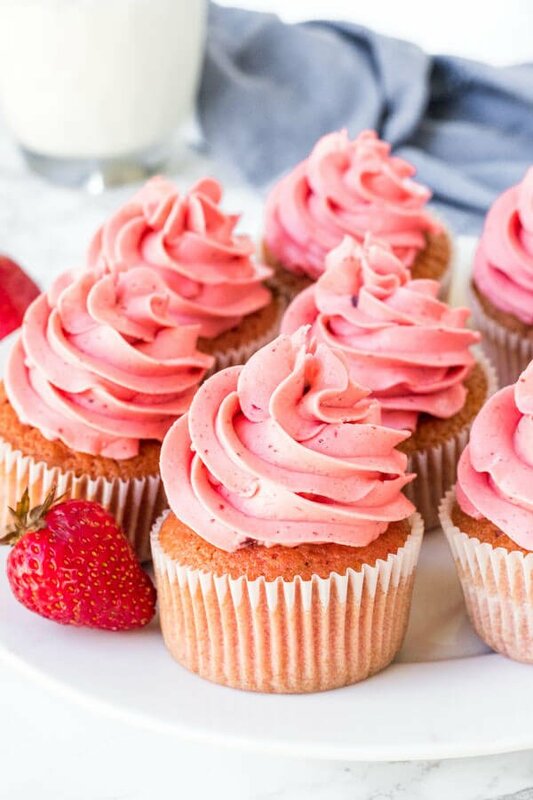 You could make vanilla cupcakes with chunks of strawberries, and then frost them with strawberry frosting. Feel free to use my vanilla cupcake recipe here, then gently fold in 3/4 cup chopped strawberries. If you simply leave out the strawberry puree from the recipe below, the cupcakes won’t turn out. 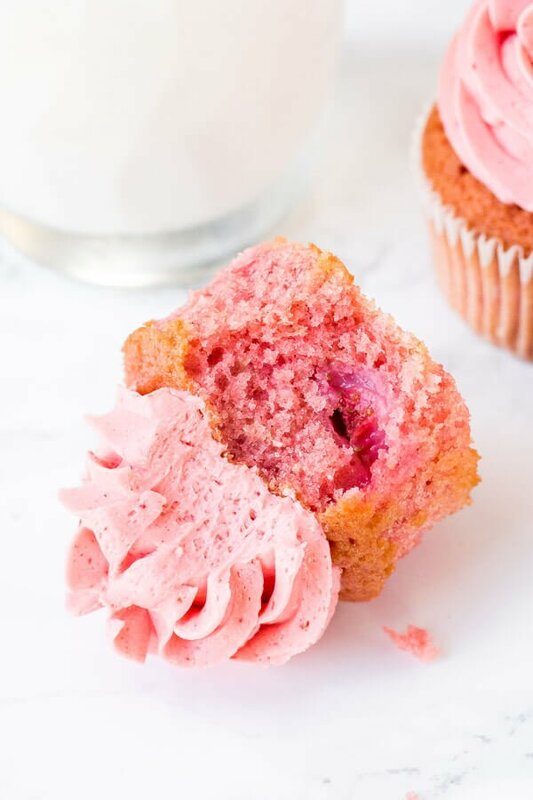 How do I make my cupcakes pink? Using strawberries that are very bright red in color, hauling the centers (removing the white part in the middle), and ensuring you reduce the puree enough will all help you “naturally” get a brigher pink color. 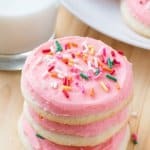 You can also add a few drops red food coloring to the batter and frosting for a brighter pink color. I did all of these things when making the cupcakes photographed. 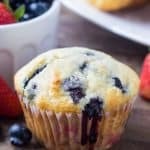 I’d like a stronger strawberry flavor in my cupcakes – what can I do? You could additionally add 1/2 teaspoon of strawberry extract to both the batter and frosting, or a 1 or 2 drops of strawberry oil. You can typically find either of these at a specialty cooking store. Can I turn these strawberry cupcakes into a strawberry layer cake? To turn this recipe into a layer cake, you’ll need to double the quantities and use three 8 or 9 inch round pans. Make sure to line the bottom of the pans with parchment, and grease and flour the sides. Bake times will vary depending on if you use 8 or 9 inch pans, but will be about 30-35 mintues – or until a cake tester comes out lean. While these homemade strawberry cupcakes require a little extra work, they are so worth it. With a delicious strawberry flavor, chunks of fresh berries, and delicious strawberry frosting – it’s cupcake heaven. These fresh Strawberry Cupcakes have a delicious strawberry flavor and chunks of fresh strawberries in the cake batter. Then they’re frosted with strawberry frosting made from real berries for the perfect pretty-in-pink cupcake. Push the strawberry puree through a metal sieve to remove the seeds (this is optional for the cupcake batter). Add the strawberry puree to a medium saucepan over medium heat. Stir gently as the puree comes to a gentle boil. Boil for about 10-15 minutes while stirring, until the puree has reduced to about 1/3 of its original volume - 1/4 cup. Cool fully. Preheat the oven to 350F degrees and line muffin pans with muffin papers. You'll end up with about 18 cupcakes total. In a medium bowl whisk together the cake flour, baking soda, baking powder and salt. In a large bowl beat the butter and sugar until fluffy (about 3 minutes). Beat in the egg and egg yolk 1 at a time. In a liquid measuring cup, whisk together 1/4 cup of reduced strawberry puree, the vanilla extract, and buttermilk. Beat about 1/3 of the flour mixture into the butter mixture, alternating with about 1/3 of the buttermilk mixture. Repeat the process until all the flour mixture and buttermilk mixture are added. Gently fold the chopped strawberries into the cupcake batter using a rubber spatula. Spoon the batter into the prepared muffin pan, filling each muffin paper about 2/3 to 3/4 full. Bake in the preheated oven for 16-19 minutes, or until the tops are set and an inserted toothpick comes out clean. Push the strawberry puree through a metal sieve to remove the seeds. (This is recommended for the frosting). Add the strawberry puree to a medium saucepan over medium heat. Stir gently as the puree comes to a gentle boil. Boil for about 15 minutes while stirring until the puree is thick like jam. Remove the pan from the heat and cool the puree fully. I typically put it in the fridge or freezer to speed up the process. In a large bowl using an electric mixer, beat the butter until fluffy (about 3 minutes). Turn the mixer down to low speed and beat in 2 cups of powdered sugar, turning the mixer up to medium speed as you incorporate the sugar. Beat in 2 tablespoons of the thick, jam-like strawberry puree. **It must be completely cold before adding to the butter, otherwise, your frosting can separate and get watery. Beat in the rest of the powdered sugar about 1/2 cup at a time until the desired sweetness is reached. If the frosting seems too thick, beat in a little cream about 1 tablespoon at a time until the desired consistency is reached. Optionally, mix in the red food coloring. Frost the cooled cupcakes with a knife, or transfer the frosting to a piping bag and pipe the cupcakes. (I used a 1M tip). *If you don't have cake flour, use 1 1/3 cups all-purpose flour and 1/3 cup cornstarch in place of 1 2/3 cups cake flour. Sift them together 3 times before using in the recipe. 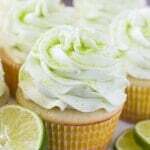 Make Ahead Tips: Cupcakes can be made 1 day ahead and stored in an airtight container. 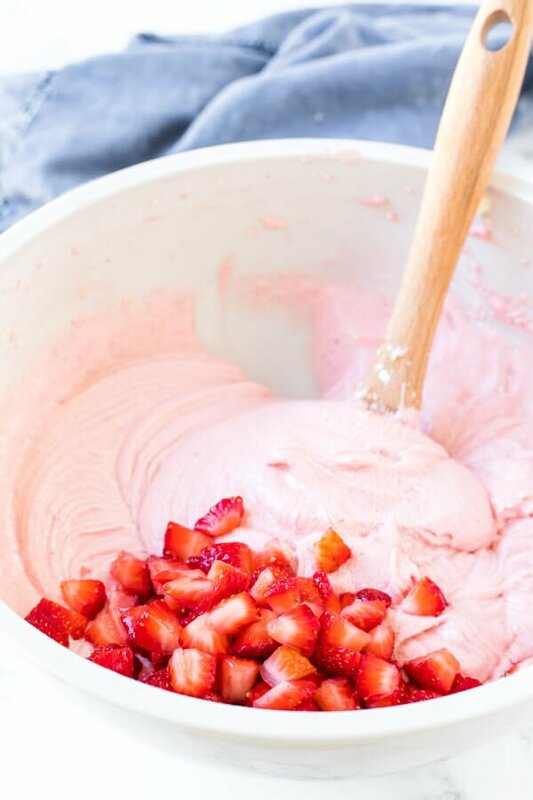 Make the strawberry puree for the frosting the day before and store in an airtight container in the fridge. Make the frosting the day you plan to serve the cupcakes, and then frost. Unfrosted cupcakes can be frozen and thawed in the fridge.